Natural things are not the presence of God but only powerless accidents which in themselves can only show him, not make him appear. We primarily know Dietrich Buxtehude as an organist, famous for his compositions for organ. We also know Buxtehude for a number of phenomenal vocal works (for example, Lobe den Herrn, meine Seele; Jubilate Domino, and the cantata cycle Membra Jesu Nostri). One familiar, although not the most famous, vocal work by Buxtehude is Quemadmodum desiderat cervus. It was composed at some point between 1680 and 1690, and presents a unique problem for musical appreciation: is it possible that a pattern we hear repeated sixty-four times can remain interesting? The form of the work is a ciaccona (chaconne). A ciaccona is a specific form with a repeating line in the bass (a technique called an “ostinato”). The harmonic pattern — the chords that the melody, violins, tenor voice, bass/continuo follow — also repeats the same sixty-four times. In this ciaccona the pattern is only two measures long. These two measures of music provide something like a long strip of pavement for improvisation, where the smallest variant is extraordinarily noticeable. This repetition can feel like stagnation; alternatively, it can feel liberating because of how uncomplicated it is. In the words of Quemadmodum desiderat cervus we find considerations of a natural phenomenon, and at least one imagined material body (a hart, often translated as “deer” in English), combined with the absolute. The desire or “thirst” referred to, however, is not something that can be satisfied by pouring a glass of water and drinking it. Likewise, a search for the meaning of Buxtehude’s accompanying music is not satisfied with a surface reading. A typical interpretation of Psalm 42: 1-2 focuses on the thirst and the satisfaction of that thirst — in this case, the satisfaction of a need identified in the senses that can feel brutally physical (as when one is thirsty). Predictably, to quench thirst is often allegorical for someone who seeks knowledge and is then enlightened. It can also be understood as experiencing a resolution of some kind. But in our case, the psalmist’s description of the hart’s desire to drink water is turned into the desire to see God or to appear before the absolute. With an immediate recognition of a face in the back of our mind, the text of the ciaccona incorporates a tone similar to that of the sensuous and visually charged verses of Song of Solomon. The music itself, with its calculated timetable, does not allow for much metaphorical illustration of desire in a harmonic form. We are presumably content with the same simple cadences falling one after the other — with a minimal amount of “musical” stress that we subsequently (and repeatedly) hear resolved without fail. This is one reason why the music does not necessarily express the idea of desire we find in Song of Solomon; the words of Buxtehude’s Latin text build toward a final sense of sublime gaudium (joy), but the music does not follow the same projection. The melody in the tenor voice conveys a major tonality, which is already cast on the music in the repeating cadential sequence, and it moves little from the home key. We might say this expresses a confidence in belief — that is, a confidence in the meaning of the words. There is little room for doubt or suffering here. The repeating cadences contribute to this notion of stability, and they constitute a foundation that is present for the entire expression of the text. One of the messages in the passage, perhaps, speaks of moderation — using Paul as an example, we should have an understanding of what lies ahead and should not race around blindly in our desire for something we do not yet know or really understand. This moderation leads to the recognition of true fulfillment, related to belief and the mind; and this is to recognize the difference between one’s self and the hart. The sentiment in “when shall I reach it?” addresses how we can get lost in the moment and become overwhelmed by one particular feeling — as though a time continuum, which has a before and after, does not come into play within the boundaries of a particular kind of thought or wish. When Augustine says “Paul himself, even Paul,” it shows how feeling this way is a natural thing and an expectation that befalls even those in the most privileged positions. The repetition of harmonic material in Buxtehude’s ciaccona emphasizes the circularity of the sentiment — the idea begins and ends with the individual, because the individual is unable to feel satisfied. This may be because the desire here is equated to that of an animal, an animal’s experience. Augustine finds Paul experienced anguish in his privileged position, and although Paul had at times a mystical-direct relation to God, he still suffered in his material body. 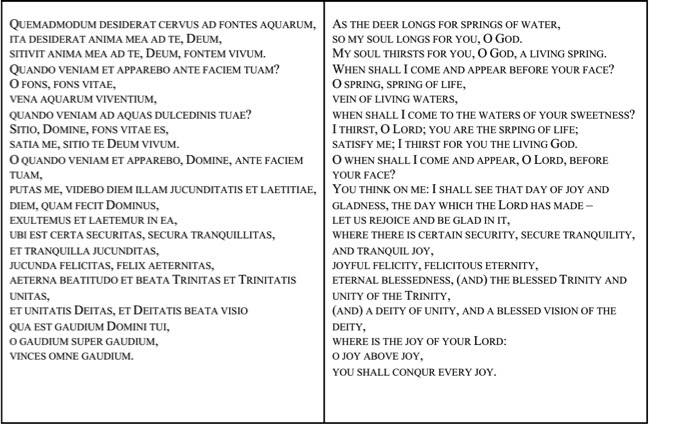 The division between nature and the weightier theological argument in Buxtehude’s Quemadmodum desiderat cervus can be noted after the line “You think on me: I shall see that day of joy and gladness, the day which the Lord has made” — a quotation from Psalm 118:24. The “day” takes our focus away from the immediate desire of thirst, and directs it toward the first verses of Genesis, toward something eternal where Day is light and good. The two halves of the text, divided after this line, determine a conflict between the material world, the desires of the material world, and what is promised in reconciliation with the absolute. What is arguably one of the most interesting parts of Buxtehude’s ciaccona is when the tenor melody reaches the word felicitas in the Latin text (in the sixth line from the end). This is because, even without the score in front of us, we hear that this word is highlighted in a peculiar way. It is very unlike that elating gaudium we sense at the end of the work. Felicitas (felicity) strikes the ear with its color suspended outside of our tonal expectations. What the note itself suggests is a much more complex chord outside of the simple cadences we have heard before. It indicates that this felicity (or happiness) is not something we are familiar with in this life (that is, it is unlike the thirst we hear about in the beginning). This is perhaps the reality of the sublime, which must cause a mysterious impression in the mind before we can comprehend it in any form against our experience. The felicitas E-flat (the note in question) is within the scale of B-flat major (and the exchange between the I – IV chord progression is typical in ciaccona form; when we see the song in F major, this note constitutes the subdominant of the subdominant). What is curious is how this melodic note sticks on the strong end of a weak beat and remains for a longer duration than any of the other dissonances in the work. It is clear that felicitas was intended to be marked in the darker realms of harmony where the glare of the floodlights of our earthly game do not creep. It pulls our ear out of the rut of the harmonious cycle of cadences. The melody note also strives upward, bent outward and away from what is normal, beyond what is expected — the ordinary, the joyous harmony, and the stillness therein. Again, much like the felicitas from earlier, this is a joy we do not really know from experience. But gaudium is not colored strangely in the music. It does not reach beyond harmonic consonance to offer insight; instead it remains within its own harmonic regions to speak of gaudium like a honeyed syrup, deep in the confines of the consonance and dissonance of the diatonic scale. It takes on the vestments of something that needed to be uncovered because now, once we have heard all about it, it seems rather evident even though it had not been so clear before. In actuality, there is no riddle here. The message of gaudium is perhaps more explicit than any other musical expression in the piece, because it is precisely within the pen of the F major scale. From a technical perspective in music, the device is painstakingly simple. From a critical perspective, it is difficult to the same extent to say anything relevant about why it is so effective. The gaudium can pose a likeness to something we know and, at the same time, be foreign to that likeness. In the last line, we hear of a joy that will conquer all other joys. This suggests that it is a joy that obliterates the material, and thus a joy that is beyond a material satisfaction. This notion quickly dwarfs the image of a thirsty hart. Even the mechanical musical support falls away, because the cadences are so familiar to the ear that we hardly notice them circling around. What we remember most from the setting is this word gaudium beyond all things. The strongest takeaway in Buxtehude’s vocal piece is this: of gaudium as an ideal consonance, braided into the absolute. Buxtehude, Dietrich. 5 Geistliche Kantaten [5 Sacred Cantatas]. Helmut Krebs (tenor), Helga Schon, Charlotte Hampe (violins), Johannes Koch (Kontrabaßgambe), positive organ and direction by Carl Gorvin. Recorded 1956, 1957. Archiv Produktion (n.d.). APM 14 088, 33 1/3 rpm. Like as The Hart, Choir of New College Oxford, directed by Robert Quinney, Novum NCR 1392, 2017, compact disc. “Clementine Vulgate, Psalm 41 (42): 1-2; after Augustine, Confessions: translated by Stephen Anderson” see liner notes for Like as The Hart, Choir of New College Oxford, dir. Robert Quinney, Novum NCR 1392, 2017, compact disc, 18. All numerical references to the Psalms follow the LXX; Clementine Vulgate, as mentioned in the translation, is Psalm 41:2-3. See, for example, Song Sol. 2:3, 4:11-15, ff. See Kerala J. Snyder, Dietrich Buxtehude: Organist in Lübeck, revised edition (Eastman Studies in Music), Rochester: University of Rochester Press, 2007, 139. Andreas Musculus (1541-81) was a Lutheran theologian. The author of Buxtehude’s text is unknown. Synder suggests a contemporary devotional manual, shared by both Catholics and Protestants, is the likely source. See Snyder, 139. See, for example, the liner notes of Like as the Hart (op. cit.). Saint Augustine of Hippo, The Confessions, Ignatius Critical Editions, translated by Maria Boulding, O.S.B, San Francisco: Ignatius Press, 2012, 374. The Confessions, 421 (Book XIII, chapter 13.14). A Forma de Vida é a revista do Programa em Teoria da Literatura da Faculdade de Letras da Universidade de Lisboa. Tem arbitragem independente E ACEITA propostas de artigos. Acompanhe ainda as iniciativas da Rede de Filosofia e Literatura. Para nos contactar, use este endereço.